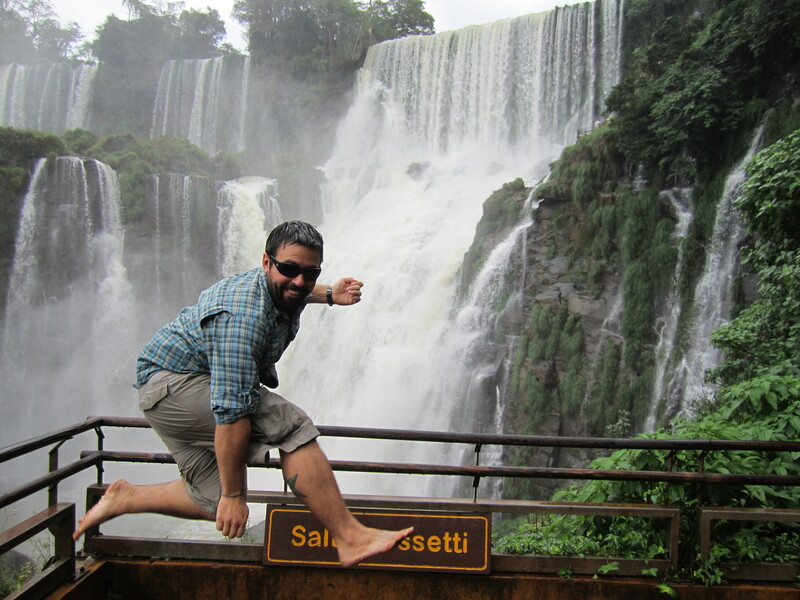 Our last adventure in Argentina, and in all of South America, was to the world-famous Iguazu Falls. 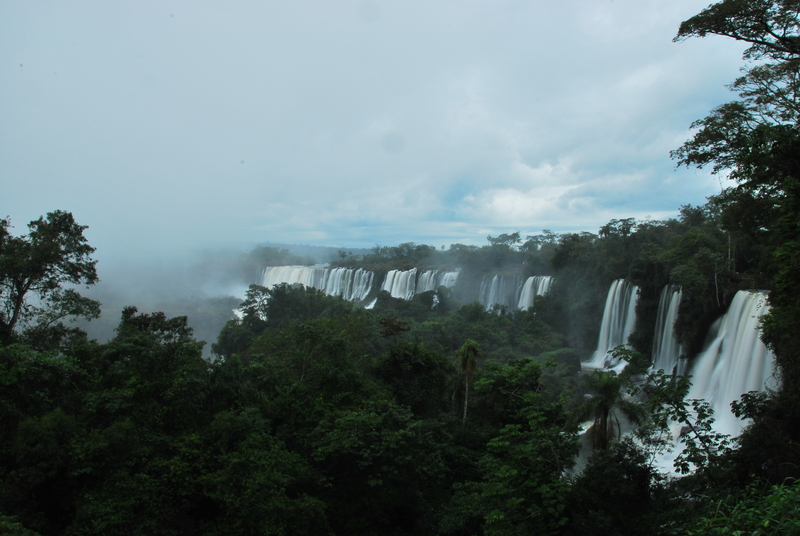 We had heard great things about these falls, and we hoped that the 25 hour bus ride would be worth it. 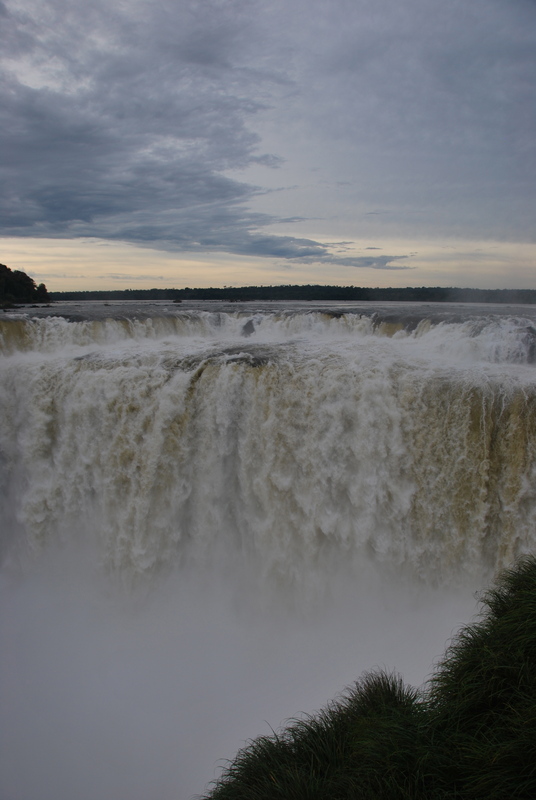 We arrived in Puerto Iguazu mid-afternoon and we were greeted by they typical tourist hustle, “Where are you staying; stay here for cheaper; eat at my restaurant;” and many other ploys to get in to our wallets. Ah, the joys of a tourist town. 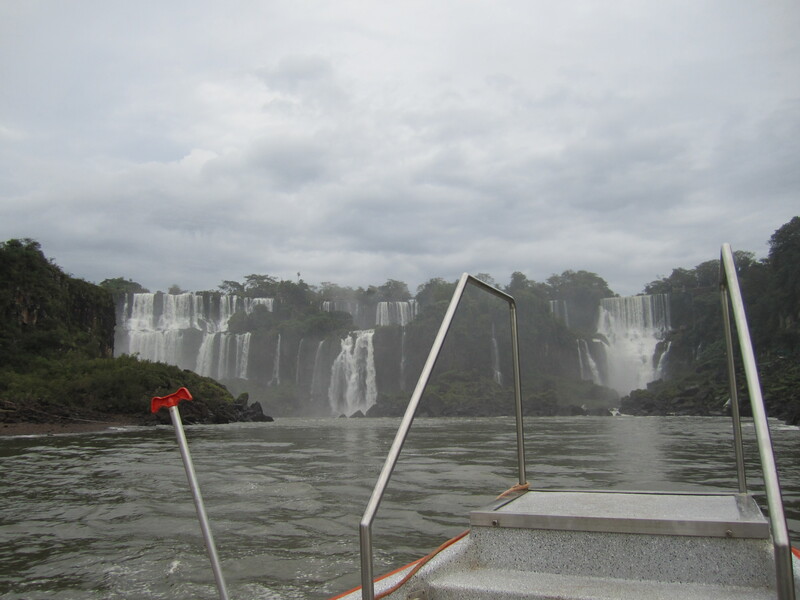 The big thing to do here is visiting the falls, so we arranged the transportation and decided to see the whole park the following day. At the park, Kristen and Bridget could not stop themselves from making numerous comparisons to Disneyland, and even Joe reluctantly agreed. It was expensive to get in, there were long lines, well-marked and clean paths, and tourists were EVERYWHERE all jockeying for the best position. The park is well-organized and easy to hike around. 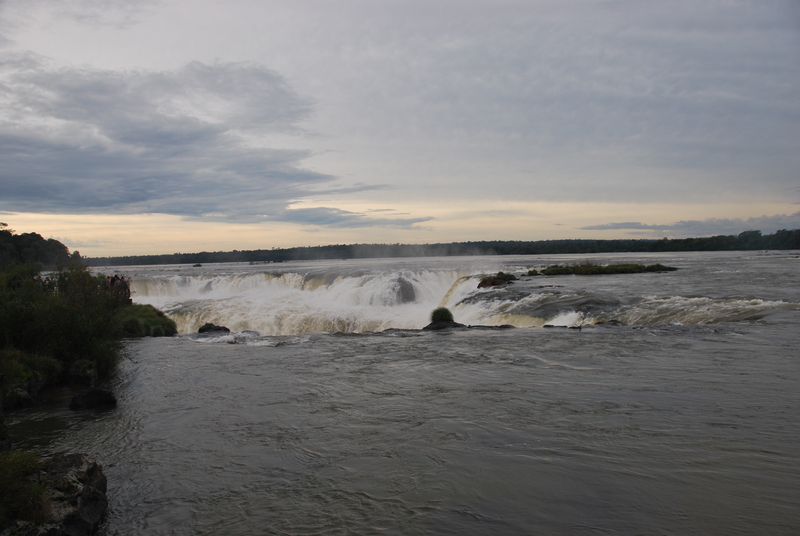 The many sights are enough to leave you spellbound, so we will let the pictures do most of the talking. 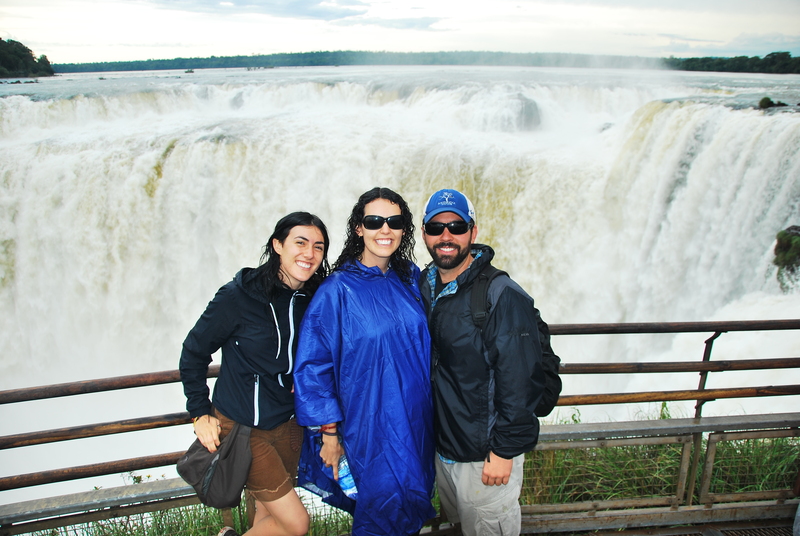 Our first stop was to the Garganta del Diablo (The Throat of the Devil), and it is arguably one of the most amazing sights in the park and on this trip. Pictures do not do this spot justice. The amount of water passing through this “throat” leaves you slightly deaf, memorized, and most likely, soaked. 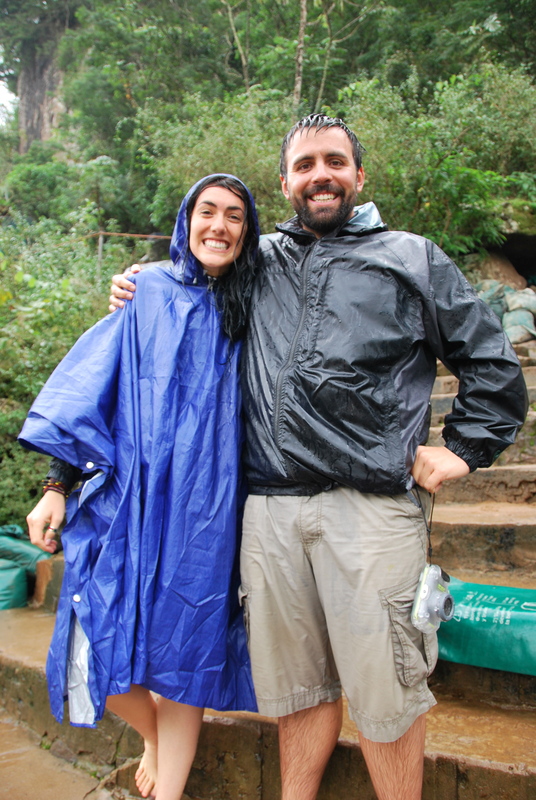 Bring a rain jacket or poncho and try to wait out the constant onslaught of water and tourists. When the wind shifts in just the right way, you can stand on the platform and remain totally dry. 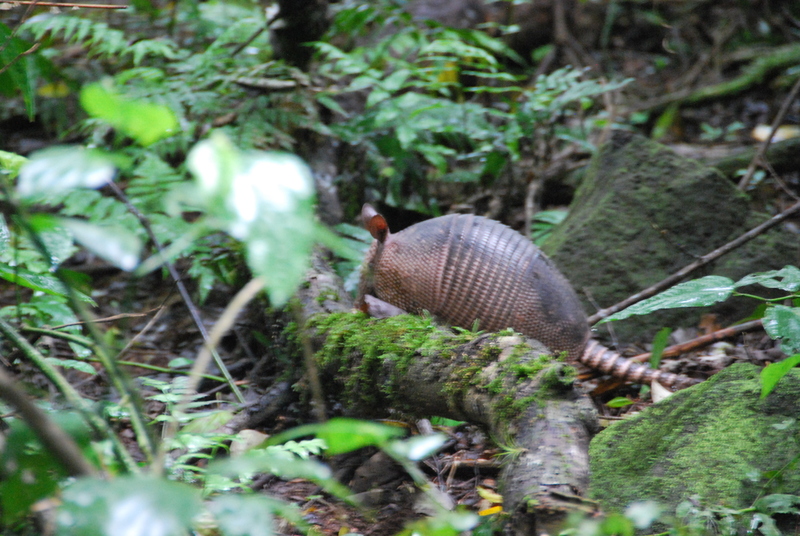 The following pictures are from the raised walkways that take you right up to the edge of this hungry beast. 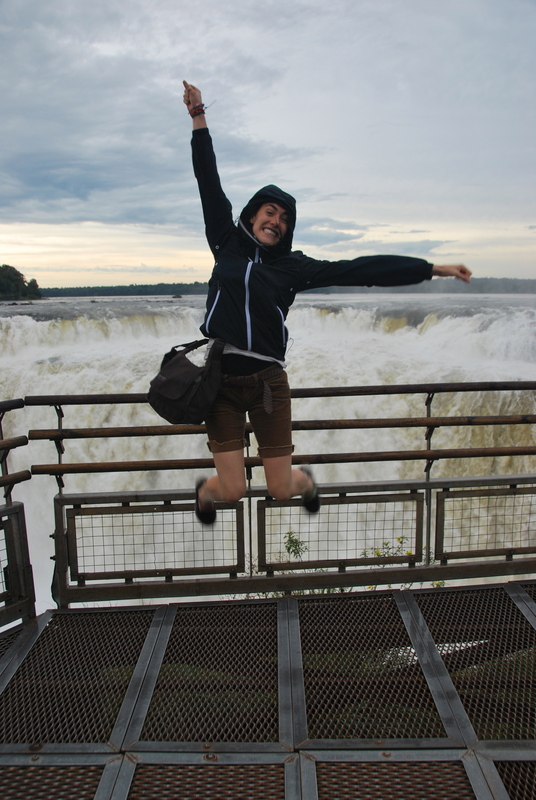 Bridget jumping for joy at the shear sight of the falls. Joe, Kristen and Bridget trying to stay dry. We read a story about a row-boat that went over the falls in the 30’s, taking all that were aboard to the bottomless pit. Just a word of warning, if anyone offers a row-boat trips, turn around and RUN! 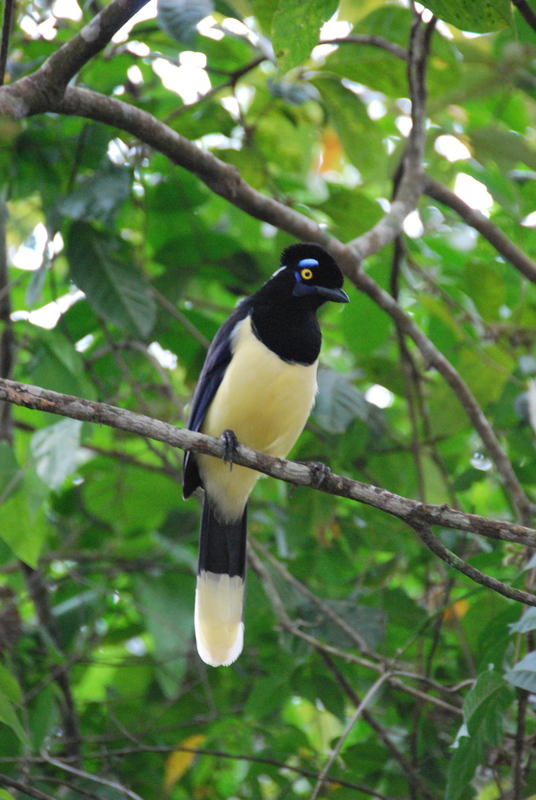 We were very surprised to see a variety of wildlife. You would think with the 10 million daily visitors (okay, that number is a bit of an exaggeration), the animals would take to the hills. 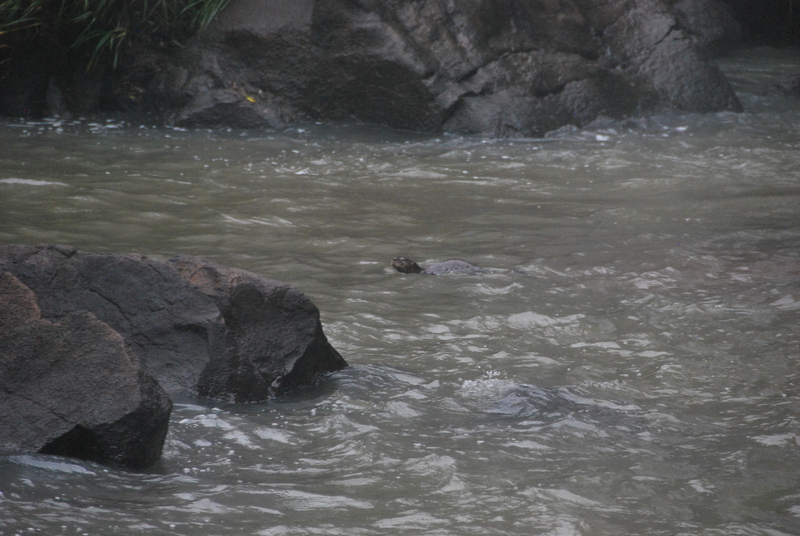 Some type of Amazonian swimming ferret. Also can be confused as a rock. Where can I get some eyebrows like those? 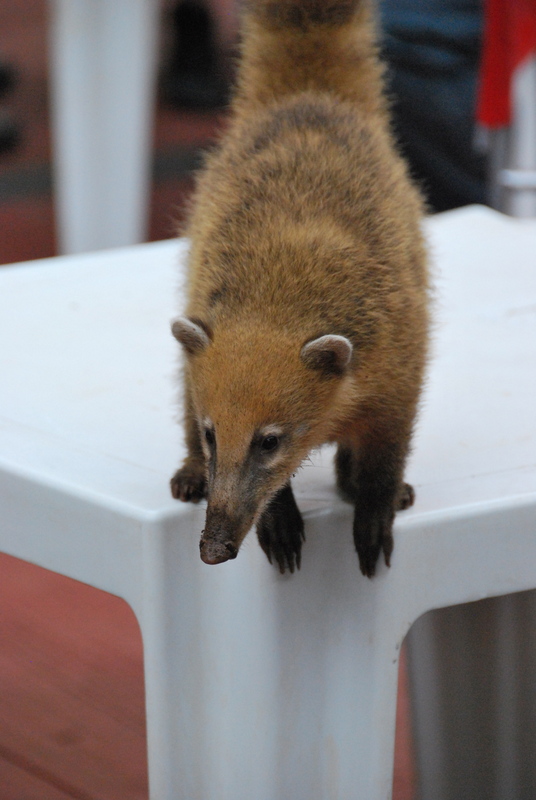 The most notorious animals that roam the park are the coatis. These animals look like a foreign cousin of our raccoons, and they have gotten a little too used to the attention (and food) they receive from tourists. Crazy Coati. Yes, he is ON a table at the snack bar area. These Coati rule the park and they have associated the sound of any plastic bag with their lunch. You really had to be on guard with these furry friends as they would attempt to steal anything you took your eyes off of for a nano second. If you want to spot these crazy animals, just head to the nearest restaurant or snack bar, but hold on tightly to your food. 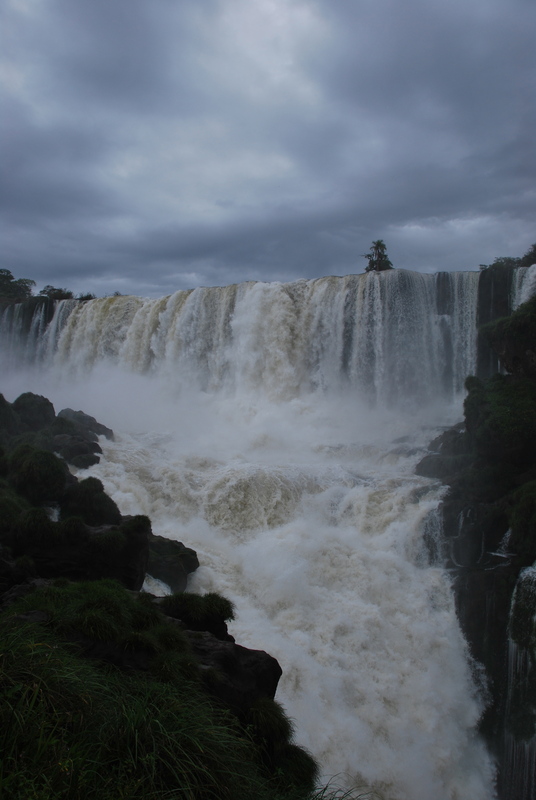 The main attraction at the park is the Garganta del Diablo lookout, but as you walk around the park, it seems that every turn there was another beautiful waterfall to take a picture of, and we aren’t ones to say no to a gorgeous picture. Joe and Kris getting hosed. One activity that Joe and Bridget could not resist was a jet boat ride up the rapids to get nice and close to some of the falls, but Kristen opted out of this one. 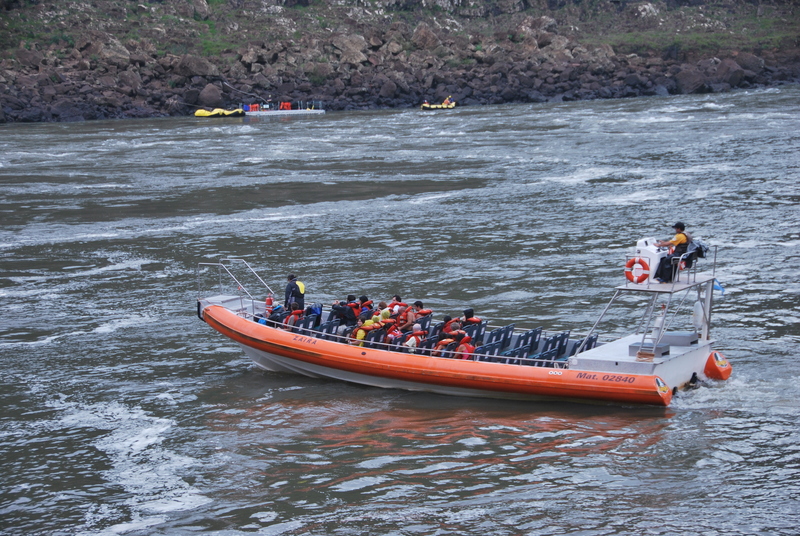 We boarded this high horsepower skiff and took to the high rapids. Joe and Bee going for a ride. 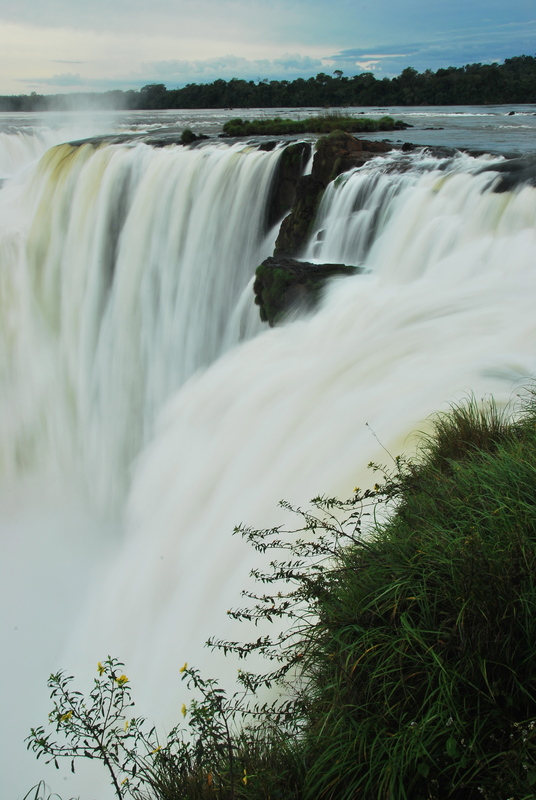 We got some great shots of the falls up close and personal. Another shot from the boat. For the first bit of the trip, we just drove around to get some good pictures and Bridget and Joe were starting to wonder if this activity was overhyped. Then the guides on the boat put all the cameras away and donned every piece of waterproof clothing they had, and we knew things were going to get more interesting. The Captain kicked it into high gear, and our high adrenaline trip started. 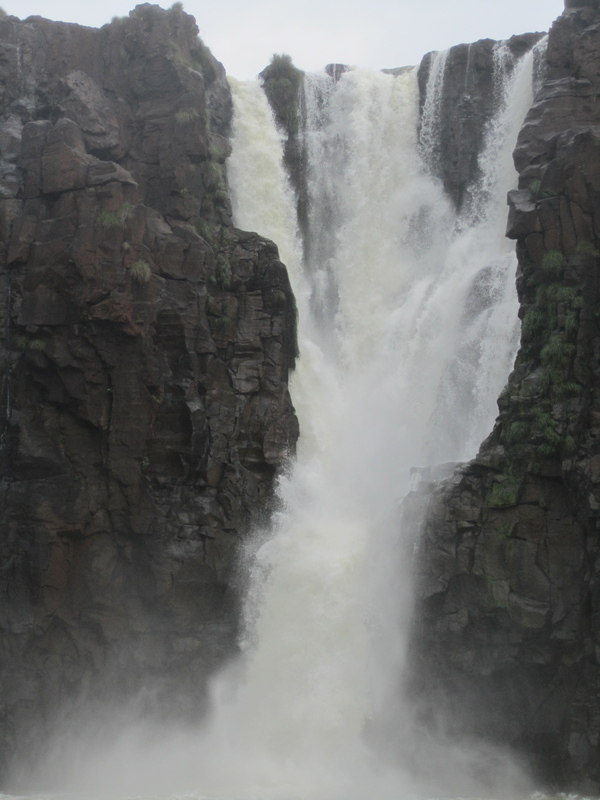 We zigzagged up the river, dodging boulders, and getting splashed by some falls. Then, we pulled up to this fall, where Joe was able to snap one more picture. The rest was a blur. 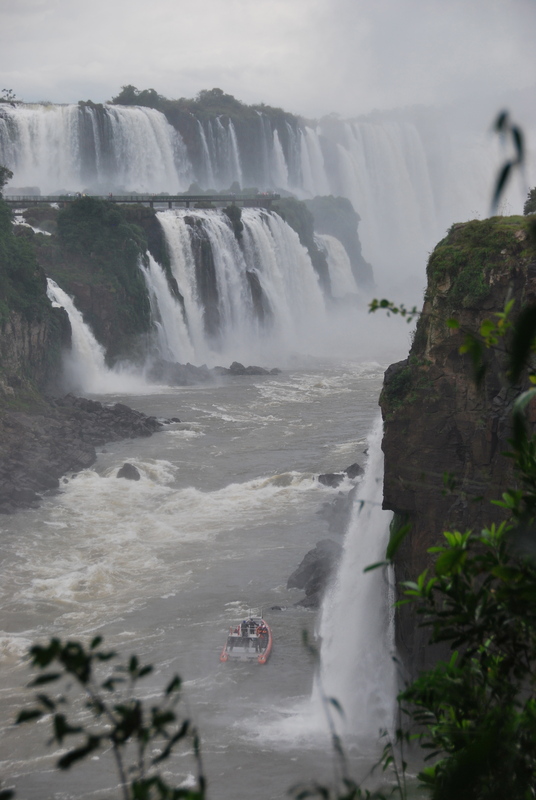 They maneuvered us right under the falls which seemed to turn our boat ride into a submarine ride. Joe had the bright idea to sit up front, and they took the full force of this fall. It was an absolute blast as Bridget and Joe couldn’t stop laughing for ten minutes. This is a good activity to do the end of the day, as even your insides get wet. Two drowned rats. FYI: all the rain gear in the world couldn’t keep you dry on this wild ride. Don’t even bother. We finished our day by checking out a few more areas of the park as we tried to dry off before the bus ride back to town. Top of the waterfall we drove into. 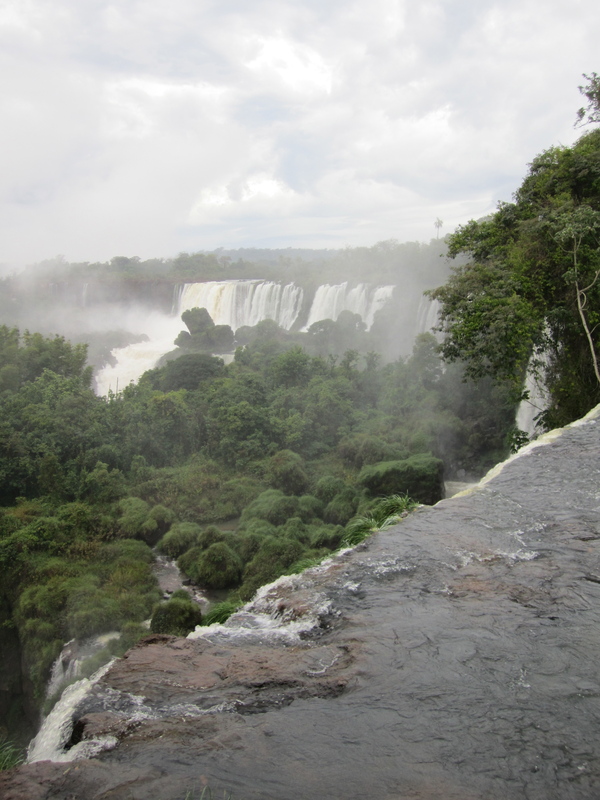 Looking up towards the Devils Throat, Brazil to the left. One last South American air guitar from Joe. 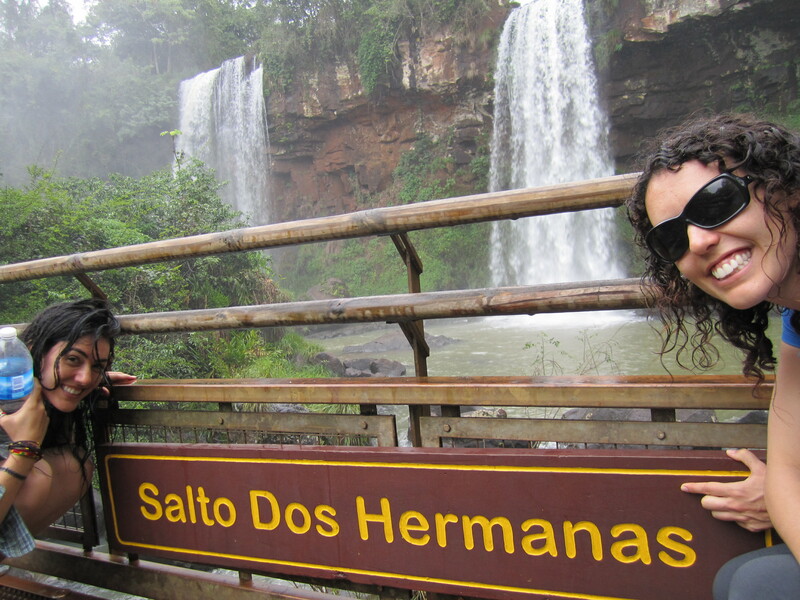 The two sisters at Dos Hermanas Falls. 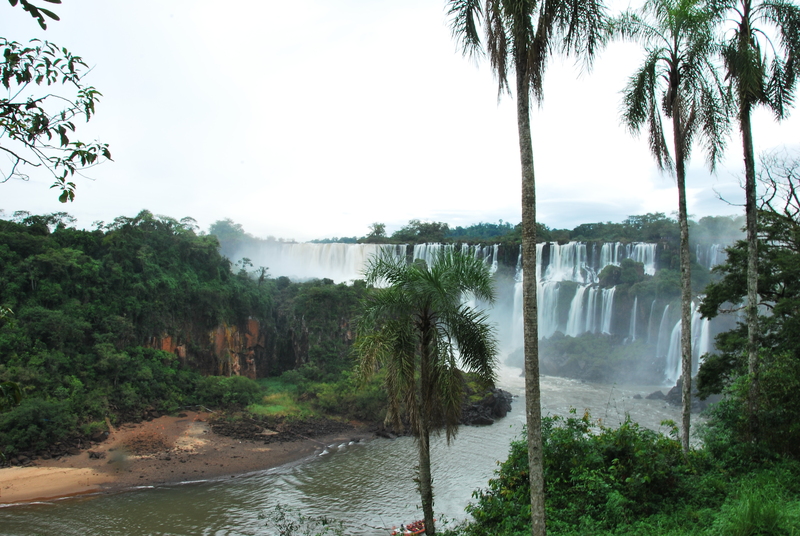 Iguazu Falls was a perfect last stop on our South American trip. Even with the big crowds, we had a great time and even found a few secluded spots. -Bring dry clothes and shoes. -Take the cheap pubic bus from town, there is no need to purchase a tour of this park. 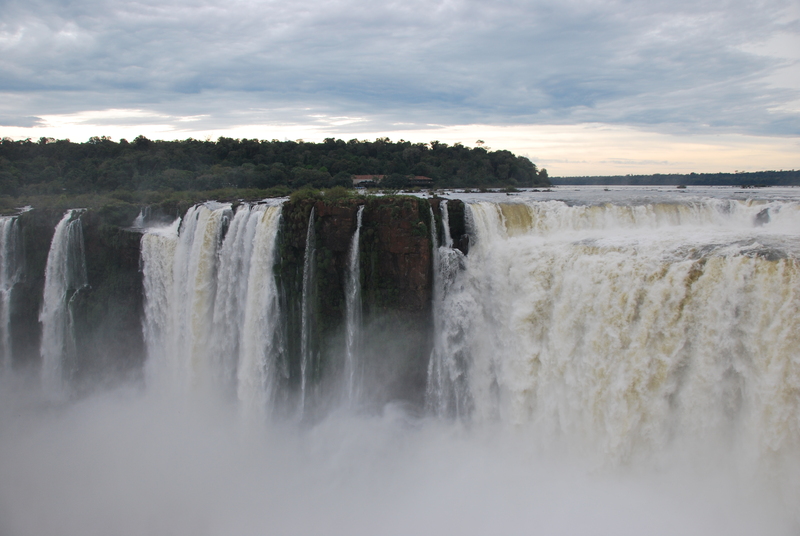 -Get to the park first thing in the morning, and hustle to the Garganta del Diablo to be among the first there. -Take the free boat to Isla San Martin before the jet boat ride, not many people do it and it feels like you have the small island to yourself. -Bring snacks, water, and food as the park tries to compete with what lunch on the moon would cost. 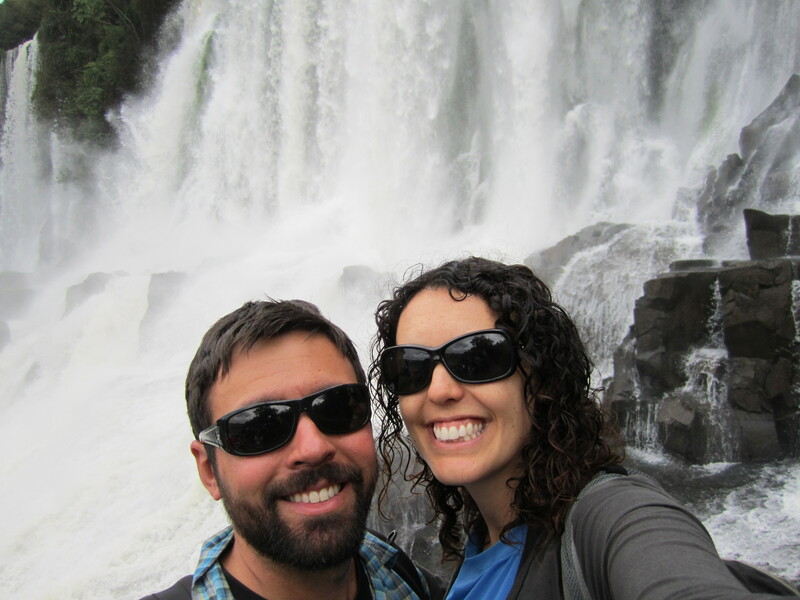 We were in shock that our seemingly never-ending South American trip was coming to a close. The day after we saw the park, we boarded our final bus overnight to Buenos Aires to catch our flight home. Boo Hoo. 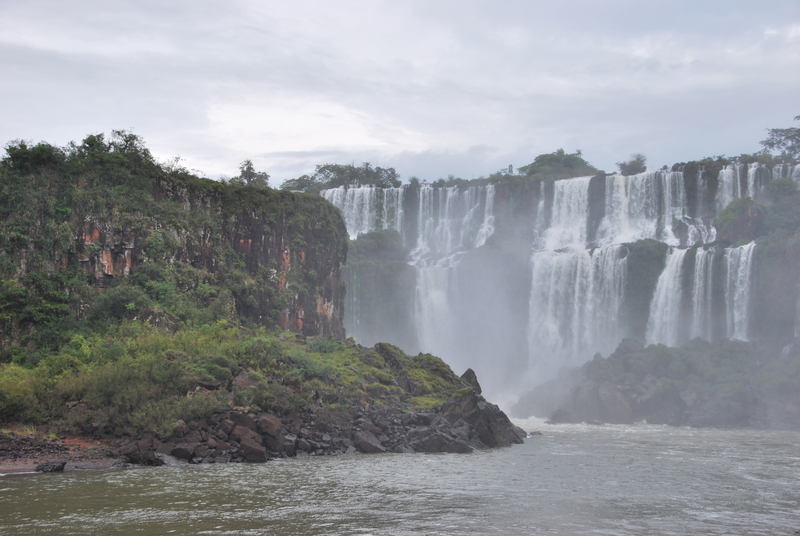 This entry was posted in Argentina and tagged argentina, argentina side iguazu falls, coati, falls, garganta del diablo, Iguazu, Iguazu falls. Bookmark the permalink.